Most people know honey is a sweet, yellowish-brown fluid made by bees. But did you know it has been used for many health and beauty benefits? Did you know you can use honey to remove blackheads? Blackheads (or open comedones) generally occur when hair follicles become clogged with oil, dirt, dead skin cells, and other impurities. As there is not much skin to attach to, they become open to the air. The top layer becomes oxidizes and turns a dark black color. This is where the name comes from. These occur most commonly on the nose, arms, face, chin, chest, back, neck, and shoulders. 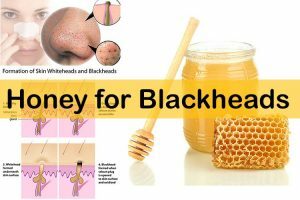 What About Honey For Blackheads? Does It Work? It acts as a natural antibiotic and helps to pull dirt from skin pores by clearing blackheads. It hydrates and tightens skin pores for clear complexion. It naturally peels blackheads from affected skin. It nourishes and moisturizes skin to get natural shine. It contains antioxidants, antiseptic, and antibacterial properties that help remove blackheads by destroying germs or impurities that clog pores. It has low pH levels that falls between 3.2 and 4.5 which is far too low for bacterial species that cause acne and blackheads. Apply raw, organic honey to your face, focusing on the affected areas. Rinse first with lukewarm water and then cold water. Repeat 2 – 3 times a week for best results. Note: Warm it up for improved results. Peel the apple and cut it into slices. Add a pinch of chopped mint and a tablespoon of cornmeal or uncooked oats. Warm a tablespoon and add it to the mixture until it forms a thick paste. Apply to your face, focusing on the affected areas. Let it sit for 10 minutes or until it dries completely. Mix a cup of oatmeal, a tablespoon of honey, and the juice from 3 tomatoes to make a paste. Scrub the paste on the affected areas. Dab a small amount on the affected areas. Cover with small bandages and leave it overnight. Remove the bandage and rinse the next morning. Mix an egg white and a teaspoon of honey. Apply to your face and allow it to dry. Note: This process not only prevents blackheads, but also helps nourish your skin. Mix a tablespoon of ground oatmeal, 1/2 tablespoon of honey, and an egg white. Apply mixture only to the affected areas. Massage gently for 5 – 7 minutes. Mix a teaspoon of finely-crushed almonds with some honey to make a paste. Repeat 1-2 times weekly for best results. Note: This process cleans the skin by drawing out impurities. Mix a tablespoon of sugar, a teaspoon of honey, and some milk to make a paste. Gently scrub a clean face with the paste. Mix a teaspoon of raw honey and a pinch of sea salt. Exfoliate the affected areas by rubbing gently in circular motion. Note: Salt helps to cleanse impurities from pores and honey helps to moisturize and nourish skin. Lemon contains Alpha Hydroxy Acids (AHA’s) and Beta Hydroxy Acids (BHA’s), which helps to removes dead skin cells and clear blackheads. It clears dead cells from the skin’s surface and controls oil production, preventing oil build-up. Cut a lemon in half and pour 3 – 4 drops of raw honey onto the piece. Rub the lemon half on your face, focusing on the affected areas. Note: Add a pinch of baking soda to the mixture for added results. Warm a small cup of honey. Cut a lemon in half and dip it in the warm honey. Scrub the lemon slices on your face, focusing on the affected areas. Let it sit for 5 minutes or until it dries completely. Repeat every other day for best results. Drape a towel over your head and stream your face, leaving a minimum of 12 inches from the hot water. Mix a tablespoon of raw, organic honey and fresh-squeezed lemon juice in a bowl. Apply all over your face while avoiding the eye area. Let it sit 15 – 30 minutes (depending on your skin sensitivity). Rinse first with warm water followed by cold water to close the skin pores. Note: Add an egg white to the mixture for added results. Mix equal quantities of honey, lemon, and salt. Gently massage the affected area with the mixture for 5 – 10 minutes. Strawberries have salicylic acids that cleanse out the open pores and unplug blackheads. Mix a teaspoon of honey, 1/2 teaspoon of lemon juice, and 2 – 3 ripe, mashed strawberries. Apply to your face and gently scrub in circular motions for 3 – 4 minutes. Oats exfoliate the skin and absorb excess oil while lemon kills bacteria. Mix 1/2 cup of rolled oats, 1/4 cup of water, 1 tablespoon of honey, and 1/4 cup of lemon juice in a small bowl. Apply to your face and gently massage in circular motions for 30 seconds. Mix a teaspoon of cinnamon powder and 3 tablespoons of honey to make a thick paste. Apply to the affected area before bed. Repeat daily until you noticeable results are visible. Lemon has some bleaching effects. Time and quantity varies by skin type. It is best to do a test on a patch of skin before using a honey mask for blackheads. If you do not suffer from any side effects like irritation, excessive dryness, or burning sensations, proceed with the treatment. Always use pure, organic raw honey to prevent skin irritations. Use thick and sticky honey for best results. Try to use the perfect honey that contains anti-microbial properties (i.e. Manuka honey found in New Zealand which has been medically proven to be very effective). Have you tried any of these methods? Do you know any other methods to treat Blackheads? Share your experience with us! Yes, leave the application overnight. It should be causing any breakouts. If the overnight application is causing your breakouts then leave the application only 15 – 30 minutes. What can I do to remove pimples marks . I can use organic face mask like turmeric , honey, and Lennon. But its not much more effective. Is there any other method which is really affect. I’m a boy so is there any method atleast to reduce these spots. Hey I got blackheads as well as pimples. Will the honey and cinnamon mask work on my skin? Yes, you can use. As both the ingredients have antibacterial and anti-inflammatory properties, it is safe to apply on a pimple. If the application is causing any unbearable tingling sensation then reduce the amount of cinnamon powder. So if I do the honey and cinnamon mask will it take away marks off my face ?? How long? And how many times a week should I do it ?? Yes, you can. It is difficult to tell the exact time as everyone’s skin different. You can repeat the application daily. Yes. Cut a lemon into half. Add few drop of raw honey and a pinch of baking soda on one half of the lemon and rub it on the blackheads. After few minutes of rubbing, let the juice stay for another few minutes and rinse off with water. Repeat the process regularly to notice the results. I have blackheads and rough skin as well. My pores are very promnent on my checks 🙁 should i use honey eggwhite and lemon after steam ? And can i replace lemon with almond oil ? You can exclude lemon juice and apply only the mixture of egg white and honey. Extract juice of 3 tomatoes and add 1 tablespoon of honey into it. Apply the mask on the affected areas and leave it on for 10 minutes. Rinse with warm water and pat dry. I have had a blackhead for a couple of months now what should i do? what mask would work best? All the masks mentioned in the article are effective in treating blackheads. So, choose any method mentioned in the article and try it. Does it matter if I don’t use raw honey? Does the cinnamon and honey treatment make pores bigger? How can I get rid of the blackheads without making my pores bigger? Nope, the combination of cinnamon and honey doesn’t make the pores bigger. The remedies mentioned above will remove the black heads without making the pores bigger. In fact they help to shrink the pores. There are no side effects of these treatments as the ingredients are natural. They are completely safe until you are not allergic to the ingredients. Excessive scrubbing or usage can be harsh on the skin leading to irritation and redness. Can I used processed honey? Nope, use only raw honey. Processed honey doesn’t contain beneficial properties and enzymes required for removing blackheads. Is pure honey and raw honey the same thing? What if I use processed honey? It is OK in our skin? Processed honey doesn’t contain any nutrients, enzymes or beneficial compounds as they get destroyed in the process. Though it may be safe to apply on the skin but it may not give effective results in removing blackheads. As per your description, the reason for the scars is unclear. Can you specify the reason? As it will be easy for us to provide right solution. I’m using raw honey and sugar mix to apply all over my face for 10 to 15mins for blackhead and pimples is it OK. Yes, it can. The beneficial enzymes present in honey help to rejuvenate dull and damaged skin. Egg white exfoliate the dead skin cells and encourage healthy production of new skin cells. What if i use a used honey is it ok? It is better to use fresh honey for effective results. Can i add Hawaiian black salt instead of Sea Salt? If i use the honey strategy would it work for blackheads? And also get rid of them quickly?